BackupEDGE 3.x supports Blu-ray Disc (that’s the trademarked name) re-writable media (known as BD-RE), in addition to the other optical media types listed above. 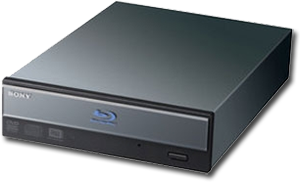 All Blu-ray Disc drives are drop-in replacements for CD / DVD drives, and come in both standard size and slim-line (notebook and server) height. All new drives are SATA or USB, although some IDE/ATAPI drives may still exist. BD-RE media comes in 25GB or 50GB capacities, and its characteristics and capacity are always detected automatically by BackupEDGE. Blu-ray Disc write-once media (known as BD-R) will be supported in a future release. Blu-ray Disc drives also support standard DVD and CD write once and re-writable media. The BackupEDGE autodetector scans all optical devices and determines the supported media types available. When media is inserted, BackupEDGE automatically determined the media type, maximum volume size, and best write strategy. No user input is required. In fact, during a multi-volume (more than one medium required) backup, it is possible to switch between any of the media types. For instance, You can insert a DVD-RAM for volume one, a DVD+RW for volume 2, and then a BD-RE for volume three and BackupEDGE would get the appropriate write strategy and maximum volume size automatically. BackupEDGE can store multiple Domains and Archives on a single medium on all media listed above supporting "Multiple Archives Per Medium". As such, a full system backup and MySQL backup can be done concurrently, or a Master followed by nightly Differentials, or essentially any of the types of backups that used to only work well on FTP, Amazon S3 or disk-to-disk backups. All of the media types listed above can be used to create RecoverEDGE boot media, and also "Bootable Backups" which are full system backups that are bootable into RecoverEDGE disaster recovery mode. All optical media is capable of Instant File Restore. BackupEDGE can access and restore files or directories instantly, without having to read through the archive sequentially looking for the data to be restored. When in multiple archive per medium mode, BackupEDGE tries to use different spots on the media as infrequently as possible by segmenting the backups into “storage sectors”. As such, the archives may be non-contiguous and spread around the media, helping to maximize the number of re-writes for a single medium. Only BackupEDGE can read media created in this fashion. As new media formulations are devised, optical media manufacturers may revise the firmware in their optical drives to support or optimize their use with the new media. It is a good idea to periodically check the support site for your optical drive manufacturer to see if a firmware update is available. This will help to ensure may years of trouble-free usage.